Tartaros trains on 3 days: Monday, Wednesday and Thursday. Per day the time and the trainer is different. The trainings are given throughout the whole year, except for academic holidays. Every Monday from 19:30 til 21:00 o’clock free training is possible. Free training means that the track is opened by an experienced member of Tartaros. Each member of Tartaros is free to train while this member is present. The experienced member provides first a warming up and then training on the track is possible. If time allows it, another round across the campus is possible finishing again on the track. For a free training it is obligatory to have signed a form stating that you train at your own risk. This is obligatory, since the training is not under supervision of a sportscentre assigned sports instructor. The form is signed by the official trainer after a small safety course has been finished. Every Wednesday from 20:00 till 21:30 o’clock the training is given by the trainer Tjerk Susan. This training also consists of first a warming up and then technique training on the track. Feel free to come by on a Wednesday evening to see if you like Survivalrun! Every Thursday from 19:30 till 21:00 o’clock a combination is made between free training and training with Tjerk. Also for this day the own responsibility form is needed to train, since you get the option to participate in the free training. 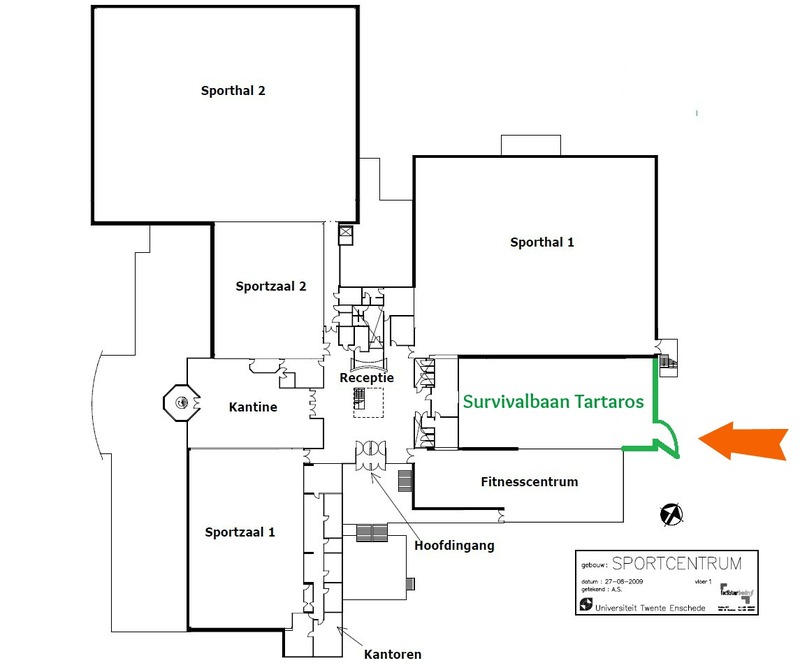 In September and in February we provide free introductory trainings every Wednesday from 20:00 to 21:30, especially meant for inexperienced students, where we teach the basics of Survivalrun. These trainings are great to try our sport, and see what it’s like. Of course you also are very welcome to come by on Wednesday to try Survivalrun during the rest of the year. With warm weather we always assemble at the track, but with cold weather, think of 0 degrees we assemble in the Hall of the sports centre for the training. We hope to see you at training! Our training location is visible on the map shown below. The only entrance is outside, shown by the red arrow.